In the 1970’s global cooling was all the rage. Would the world survive the coming ice age was the question on scientist’s lips? The answer was up for grabs, but that the certainty that the coming calamity was real was not. How to thwart the disaster was a problem with the scientific community’s best minds working on it. One of the ideas was to paint the vast ice sheets of the Arctic black to get them to melt, such was the hysteria of the day. A decade or so later the cooling hysteria was gone. It had been replaced by a new villain, global warming. This time it was not nature that was deemed out of control, but man. CO2, one of the weakest of the so called greenhouse gases, was on the increase and consequently the earth was doomed. During June 1988 a conference was held, in Toronto, to address the scientific communities latest calamity. The Changing Atmosphere: Implications for Global Security conference was not the first such event to declare Global Warming a problem, but it was the first sizable and credible conference of scientist and environmentalist to call for global governmental action. It was the origin of the first real push for global restrictions on CO2 emissions, and by default the burning of fossil fuels. Many world leaders responded to the call for action including Britain’s Margaret Thatcher. The conference ignored the global cooling fiasco of some years earlier, one led entirely by climatologist. This new climatic disaster was different, it was led by a conglomeration of activist, left-wing politicians, environmental scientist and a few climatologist. In fact, many climatic scientist and meteorologist were wholly unconvinced and even skeptical of what was motivating the doomsayers. The conference seemed to have an agenda, one of controlling the world’s fossil fuel supply and by default its development and wealth distribution. One of the first schemes rolled out to combat this latest scourge was a carbon tax. It was to be implemented in conjunction with trading in so called Carbon Tax Credits. Aimed solely at the world’s most affluent nations, the tax would force reductions in fossil fuel usage at the expense of people’s standard of living. Carbon Tax Credits, purchased mostly through large exchanges, could be used to offset the taxes with money mostly funneled to third world countries and people like Al Gore who set up the exchanges. The whole thing stank of being an environmentalist/globalist shakedown. The science was shaky and relied on antics worthy of the Wizard of Oz. They had to be used in order to blackmail the world into what was essentially economic suicide. There was a hockey stick graph that used computer modeling to show the earth’s climate was going to be get very hot very soon. When a creative skeptic showed the computer program created the same graph no matter the data, even random numbers, the movement became angry that the deception was revealed. That was followed up by a series of new computer models with equally dire predictions. Emails from one institute showed the data for these was being manipulated to come to foregone conclusions. As the wild predictions inevitably proved to be false, they were quickly replaced by another and then yet another. Not one Global Warming prediction has ever proven to be accurate!. Even so, school books were re-written and curriculum’s created to advance the theory. Even worse, history that seemed inconvenient to the movement was erased. The little Ice Age did not appear on historical temperature charts nor did the well known Medieval and Roman warm periods. Instead of the normal ups and downs of earth’s oscillating climate, students were treated to improvised data showing earth’s climate to be stable until only recently. Facts no longer seemed to matter, those who questioned the hysteria were just deniers and put on the same plane as those who refused to accept the Holocaust had happened. Al Gore for awhile was the unabashed leader of the Global Warming movement. He wrote a book and made a movie, both filled with falsified data, to push for action. He was rewarded for his efforts with a Nobel Prize, accolades and becoming the world’s first carbon tax credit billionaire. That he lived at the time in the most energy intensive home in Tennessee, flew in private jets and even arrived at destinations in fleets of SUV’s did not seem to matter. Restricting energy was for the little people, not environmental demigods like him. The fact is Global Warming alarmism has never been about the climate. Its advocates were mostly concerned with globalism and socialistic schemes of wealth redistribution. The pseudoscience of Global Warming was just a means to an end. 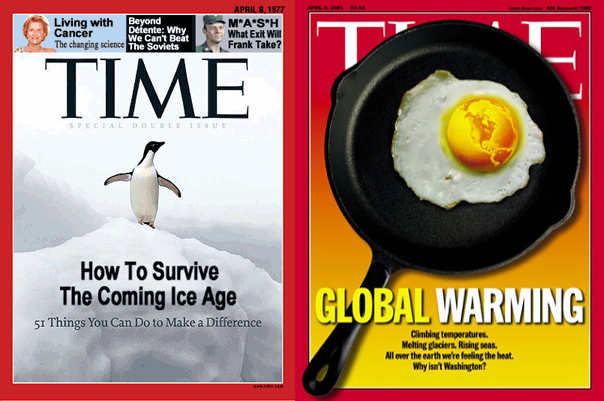 While it is true the climate on earth has and is changing, it has been that way since it first wobbled around the sun. People use to ice skate on the Thames in London and sell trinkets from stalls on the ice. In southern Greenland the Vikings raised crops and enjoyed its once mild climate. Roman’s grew grapes in areas now too cold to do so, then awhile later on the French rioted for lack of food due to harsh cold conditions. The villages found under the sea and remains of forest in what is now desert is testament to constant climatic change. To claim that such changes are now all man made is little different than people in Medieval Europe blaming the plague on witches. What is certain is the climate will change and mankind needs to adapt and be prepared for the inevitable. Maximizing wealth through capitalism and the advance of the rule of law will do more to alleviate the inevitable results of earth’s climatic fate than snake charming and Global Warming hysterics ever will. When Climate change happens, as it inevitably will, mankind can only hope it is warming that comes next. Another ice age will likely wipe much of mankind from the face of the earth. While warming is preferable, I doubt that an Ice Age will wipe out man – unless it is accompanied by the sort of global stupidity that gave rise to AGW. Completely no, and no one alive today is likely to be around to find out how the next ice age shakes out anyway.